Private art class - Let Bologna be your muse! Our fall week in Bologna, in the Emilia Romagna region, promises to be a food & culture lovers delight. Bologna is ideal for anyone wanting to learn about real, authentic Bolognese cooking, art and culture. Fondly known as "Bologna La Grassa" or Bologna the Fat, this city is Italy's culinary birthplace. Emilia Romagna is home to the King of Cheeses - Parmigiano Reggiano, Prosciutto di Parma and Balsamic Vinegar of Modena. Not to mention home to the original stuffed pastas such as Ravioli and Tortelloni. Arrive at your four star accommodations, settle in and unpack and prepare for our welcome celebration dinner. Our home for the week will be a centrally located four star hotel. 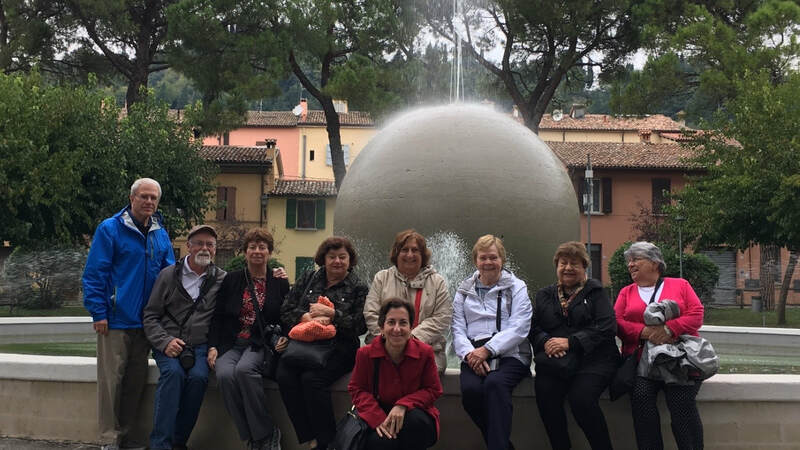 The week will include private day trips to Ravenna & Ferrara, a visit to factories that produce products such as Parmigiano Cheese and Prosciutto, one private cooking class, as well as a private walking culinary tour where we will visit some of the city's most beloved shops. A private culture walking tour will allow us to get to know our host city. Spend a memorable fall week in Bologna! Enjoy seasonal meals, art, culture and Italy's Dolce Vita!! Afternoon: Arrive at your four star accommodations. Settle in and unpack knowing you will not have to repack for the entire week. Ward off jet lag with a quick walk to a local specialty shop and perhaps grab your first gelato for the week. Evening: In the evening, we will meet for our first group activity and have our first taste of real authentic Bolognese cuisine in a group dinner in a carefully selected location. Learn about the city and discuss the plan of the week ahead. Fun at our cooking class! Today we head to the kitchen for our cooking class. Our morning includes a market visit where we will shop for our ingredients for class. Our menu includes typical Bolognese dishes with preparation of the dough for pastas such as Tagliatelle or stuffed pasta, typical sauces will also be prepared. We will enjoy our efforts for lunch. The afternoon will consist of a city walking tour led by a private, English speaking guide who is a native of Bologna. This will allow us to get to know our city and our local main attractions. Walk off some of the calories from lunch while getting to know the history of Bologna. Some of the main attractions include Piazza Maggiore, Neptune Fountains, the Basilicata of St. Petronio, the Archiginnasio Palace and Bologna’s famous towers, and much more. Evening on your own to enjoy at your leisure. Today's daylong trip will be a feast for all senses as we take on Italy's Food Valley. This once-in-a-life-time experience will take you to where the most famous and delicious Italian foods are made. The day begins with a morning excursion to a cheese factory where you will experience the entire production process of Parmigiano Reggiano Cheese. The tour continues to one of the region’s historic acetaia, a family-owned farmhouse where the famous Traditional Balsamic Vinegar of Modena D.O.P. is made. From the acetaia we will head towards one of the best prosciutto factories in the region. At their factory in Modena, you will learn all about the strict regulations, the lengthy curing process, and the tremendous care that goes into ensuring that all D.O.P. prosciutto meets the high standards required by the Italian government. Generous samples will be provided throughout our stops plus a memorable 6-course lunch on location will follow. Enjoy the evening on your own to enjoy at your leisure. After breakfast at the hotel, we will explore one of Bologna oldest food markets with an insider, and visit the most traditional food shops. Learn about the history, culture and architecture, which make Bologna's medieval market so unique. Our tour will offer several authentic tastings at a variety of places such as the food market with its ancient family-run shops, the oldest bakery in Bologna, the oldest chocolate factory in town, a pasta laboratory and a gelato shop, just to name a few. Samples will be provided throughout the walk. After a short break, we will try something different! Are you ready to try your hand at watercolors? A medieval city with an ancient university, known as the city of terracotta and the Italian food capital, the city will be your muse for this afternoon’s activity. On this 4-hour tour you will discover the natural beauty of Bologna with an American expat artist who has called Bologna home for over a decade. You will be able to create a unique souvenir from your time in here. You will be guided to create a watercolor, following easy and fun step-by-step instructions. Immerse yourself in the colors and nature of Bologna with this special activity. A casual group dinner at a historic Bolognese restaurant is scheduled for this evening. Enjoying lunch in Ravenna after a day of sightseeing. Ravenna was once one of the most important cities in the western world. The last capital of the Roman Empire in the West, it subsequently became capital of the Gothic kingdoms of Italy and of Byzantine Italy. The early Christian Byzantine mosaics in Ravenna are the finest in the world. Ravenna is a European "superstar" city which attracts visitors from all over the world, thanks to its unparalleled Byzantine mosaics with complex allegorical meanings. We will visit the Mausoleum of Galla Placida, which has the earliest mosaic scheme in Ravenna, San Vitale’s Basilica, the Neonian Baptistery with superlative early Christian mosaics, the Museo Arcivescovile with St. Andrew’s Chapel and St. Apollinare Nuovo. After lunch, our day will continue with the visit to Ferrara. In 1995, UNESCO classified Ferrara's historic center as a world heritage site. Upon arrival to Ferrara, we will visit the Estense Castle, originally fortress and later splendid Renaissance residence, the cathedral, unusual and perfect fusion of different styles, Romanesque and Gothic. We continue with a walk through the Jewish Ghetto, ending with the characteristic Via delle Volte, very old street, used by the merchants, lying alongside the original branch of the river Po. Evening will be on your own. Enjoying an olive oil tasting in Brisighella. Today, we explore Bologna's wine country. We will visit a traditional winery, walk through beautiful vineyards and see the cellars and enjoy a wonderful wine tasting accompanied by local foods and delicacies. We will have the opportunity to enter a ceramic workshop and see the artists at work. Faenza is noted for its manufacture of majolica ware glazed earth ware pottery, known from the name of the town as "faience". See all the ceramic production phases from the pottery molding, to the hand made decoration, and the crystal glaze application. We will have the opportunity to explore the charming medieval village of Brisighella and enjoy a tasting of different olive oils produced in the area. Our final dinner in Bologna. Today you can enjoy the day on your own to walk about the city with freedom. Visit the many fabric shops all within walking distance to our hotel, or perhaps shop for some souvenirs at the many specialty food shops nearby, visit a local museum or simply enjoy Italy’s “Il Dolce Far Niente” – the sweetness of doing nothing!! Lunch will be on your own today, and we will reconvene for our farewell Dinner in the evening. The week in Bologna is winding down. Enjoy breakfast at the hotel before checking out. ​A deposit of $1,000 per person plus signed travel agreement is required to secure your spot.